That's a relief. Last week's leak of the route for the 2012 Tour De France route had me worried, but yesterday's official announcement has eased some of those misgivings. When this year's Dauphine Libere avoided the sport's most famous climbs I'd assumed that organisers ASO were trying to give them a breather and keep them fresh for Le Tour. The leaked Tour route, however, had no big name mountain finishes either. As it turned out, I needn't have worried. 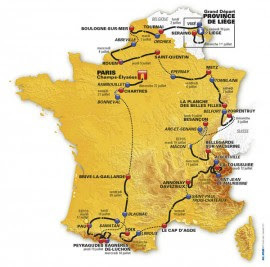 The big names are all there-the 2012 Tour's 4 mountain stages will be going over the Croix de Fer, the Madeleine, the Glandon. the Aubisque, the Peyresourde, the Tourmalet, the Aspin and Port de Bales. That's a hell of a lot of big name mountains. What's interesting is that none of them are hosting the finish. Little used or brand new mountains are taking those honours, perhaps in an attempt to introduce some new legends to the race. Two names stand out in particular, the Planche de Belle Filles and the Mur de Peguirre. Belle Filles will feature on stage seven and looks hugely interesting. It reminds me of Pena Cabarga, too short for slow battles of attrition, but too steep for careful group riding. With slopes of up to 20% and a 14% finish, we'll see some short, explosive attacks here. It won't ruin anyone's legs, but it should produce some big gaps that will ruin a few GC contenders. Mur De Peguirre, on the other hand, reminds me a bit of Bola del Mundo. I've no idea how scrubby or misty it gets, but it has a similarly simplistic profile. It gets steeper. Then steeper. Then steeper still. Most mountains have some waver and wobble in their ascents. Not this one. Its percentages march steadily upwards in a way that must break a riders heart. If you're suffering halfway up, tough. It gets worse. If you're suffering three quarters of the way up, tough, it gets worse. If you're suffering in the final two K, tough. It gets worse. It isn't a nuanced mountain where riders will vary their tactics according to the gradients they prefer. It's a ramp that will ask more questions of the rider's hearts than their legs. For all that the sheer number of TT miles pretty much rules the Schlecks out of contention, this isn't a race that rules out the climbers. It favours TT specialists, certainly, but only the ones who can climb defensively as well-it favours TT specialists of the Evans or Wiggins stripe, not the Cancellara type. When I first became interested in cycling in the 90s the oft heard logic was that science had made great advances against wind resistance, and none against gravity. It was said that pure climbers would never win Grand Tours again. Even Pantani's GT double in 98 was seen as a blip in the asendancy of the testers. As it turned out, such predictions were far wide of the mark. More mountains, fewer time trials and the rise of the diesel climber over the explosive type has once again made the mountains the true testing ground of a GT. That's the way I like it, but I do look at this Tour de France route, which resembles a 90's course more than any I can remember, and I feel a frisson of anticipation. It's a route that demands versatility. I suspect we won't see any displays of crushing dominance from the winner, and with the exception of stage 17, maybe no moments of high drama that upend the race. On the other hand, I do think we'll have a close, unpredictable race, one where dramatic peaks and troughs are replaced with a constant buzz of tension. It might not be the sort of race I want to see every year, but it will be a good race, and it will have an enjoyably different tone.